Inform your students and help the environment! You can now add another lesson to your classroom instruction. 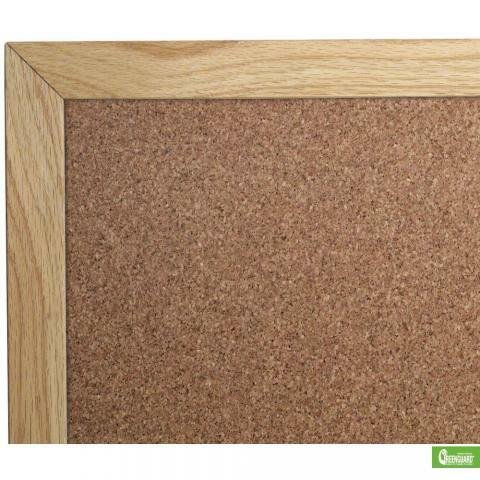 By ordering the Framed Bulletin Board, you incorporate an environmental message that sets an example for your students. The 100% natural cork surface attaches to sturdy substrate to ensure longevity. Our naturally renewable cork has a self-healing capability that makes it a superior posting surface. You heighten the visual appeal of the stylish wood trim by choosing between an oak or mahogany finish. Choose one of 10 sizes to meet your posting needs. You can order one that does not take up much room or a large Framed Bulletin Board that allows you to post student artwork, upcoming special events, and recent test grades at the same time.